On February 1, 2016, San Francisco Mayor Edwin M. Lee announced Armistead Maupin, local icon and acclaimed author of the Tales of the City series, has been named to receive the 2016 Mayor’s Art Award (view full press release). 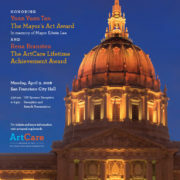 Mr. Maupin will be honored with the award on March 29, 2016 at a fundraising reception hosted by ArtCare: Friends of the San Francisco Arts Commission. 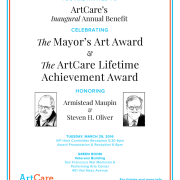 The event, ArtCare’s Inaugural Benefit, will also honor Steven H. Oliver with the ArtCare Lifetime Achievement Award. The award ceremony, celebration and reception will be hosted at the Green Room of the newly renovated War Memorial Veterans Building. For more information, sponsorship opportunities or to purchase tickets, visit the event page here. 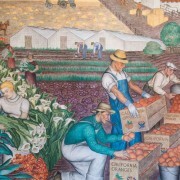 In 2014, ArtCare was awarded $100,000 from Bank of America to support the restoration of Coit Tower’s 27 historic murals as well as arts education programs that bring the artists and their murals to life. ArtCare has also funded the restoration of the seminal 1971 Peter Voulkos sculpture at the Hall of Justice; the Man Lin Choi sculpture, Movement: The First 100 Years, 1982, located on the Embarcadero’s Sue Bierman Park; and Keith Haring’s 1989 Dancing Figures at 3rd & Howard streets. More can be found on the Completed Projects page.